Boy, I love me some avocado. Diced in a salsa. Sliced on a burger. Mashed into guacamole. Sometimes you can find them at the grocery store or farmers' market on sale 2 for $1. The catch? They're green and hard as rocks. To help ripen a green avocado, place a banana and the green avocado in a brown lunch bag and keep it on the kitchen counter. The natural ethylene emitted from the banana will help ripen the avocado in a day or two. Once it's ripe, you can store it in the refrigerator for several days. Also, if you are not using the entire avocado, but only need a few slices, you can keep it from browning so badly by leaving the seed intact with the remaining flesh and pop it into the fridge. Then when you're ready to eat it, just cut a very thin brown layer away from the avocado and enjoy! Sometimes squeezing a little lemon or lime juice will help slow down the oxidation but it will brown a little. 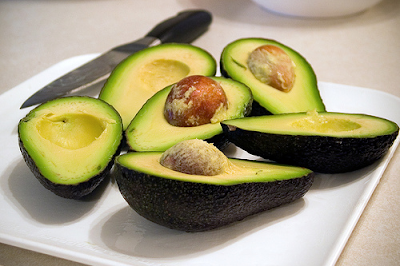 Leaving the seed in the avocado reduces the amount of area you'll need to slice away. Being from California! my favorite thing is to buy fresh, ripe avocados at a farmer's market! with lime juice and some sea salt! YUM! Thanks for sharing your tip on ripening avacado's. I haven't tried the bag thing, but have found that when I place the avacado in the fruit basket with banana's it ripens in a few days. Also, if your lucky enoiugh to have a Sam's Club near by, they sell bags of 5 avacado's for just under $4. What a great tip! I had no idea you could ripen them like that. I love you, maybe as much as I love avocado! No, seriously, hard avocados annoy me. I want my green goodness NOW. Your tip may not work instantly, but it's sure nice to know I can have those unripened avocados a lot faster. I like the idea to leave the seed in a half to save it, too. BTW, did you know that avocados won't ripen on the tree? They have to be picked first! When I use half an avocado I mash up what is left in a small baggie, squirt a little lemon or lime juice and roll up cigar looking and then freeze. It thaws in minutes and is perfect for guac and in maki rolls. I will now be using your tip if I want to eat the avocado soon.